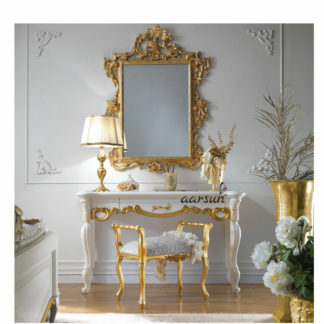 Add a touch of class to your bedroom decor with this stylish dressing table. Aarsun Woods offers to you handcrafted wooden dressing table made from premium quality teak wood by skilled artisans. The styling dressing table is best suited for modern day homes. The dressing table with four designer drawer with dressing stool. They are finished with natural color. The Wooden dressing table top center lifts with mirror it look very modern. Note: Please note that the mirror is not provided in the deal.